bu-curious word of the day: mahayana ‘n more! Taking some more baby steps today. Here are a few more basic terms that I’ve come across often in my first months of Buddhism. 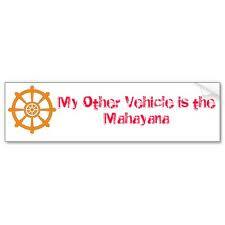 MAHAYANA: Pronounced “mah-huh-yah-nah”. This is the branch of Buddhism that originated in India and is believed to be the closest to the Buddha’s teachings. Chinese, Japanese, Korean and Tibetan traditions are derived from Mahayana. Through this vein of Buddhism, practitioners evolve for the benefit of all sentient beings. Mahayanists treasure the contributions made by Bodhisattvas throughout history, whose compassionate and wise contributions are told in classic Buddhist stories and scripture. BODHISATTVA: Pronounced “boh-dee-saht-vah”. The Bodhisattva is inspired through compassion to awaken through a committed Buddhist practice that benefits all sentient beings. SENTIENT BEING: This term can represent all conscious life, but it also refers to those who are not enlightened and are therefore trapped in Samsara. SAMSARA: Pronounced “sham-sah-rah”, this is the unending cycle of birth, suffering, death and rebirth. Enlightenment releases sentient beings from Samsara. BODHICITTA, “boh-dee-chee-tah”, this is the compassionate state of mind of the Bodhisattva that serves as primary motivation for all actions. AVATAMSAKA SUTRA: Loosely translated in English as the Flower Garland Scripture, this is 40 chapters of scripture about interbeing and the path to enlightenment as taught by the Buddha not long after he became enlightened around 500 BC. Don’t forget to share, tweet and tumbl. And please “like” this post right here if you took something from it!